Once I submit my application via Stack Overflow Jobs, I get a white empty message box overlayed on a black background with no way to exit (pressing Esc) or any intended buttons on the white message box like Okay. Please see the image below. 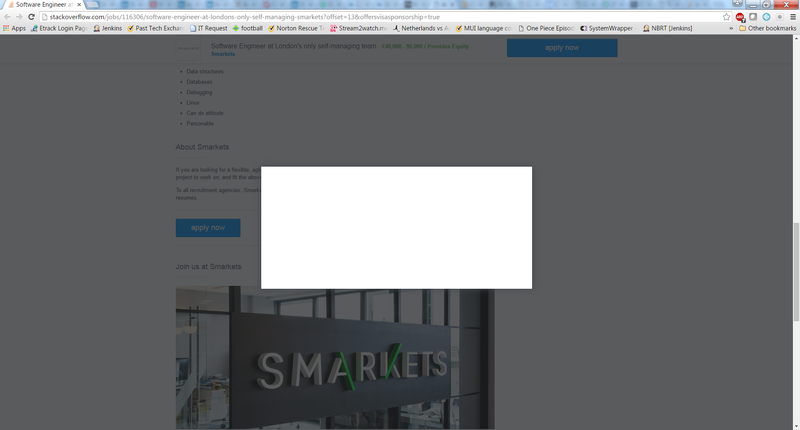 The only way to exit this screen is by reloading the page. I believe showing a blank overlay isn't the intention here! This is most likely happening because you have adblock on. Disable it and it should load fine after the submission.